Lodger facility for an RN Air Section on Twelfth Air Force fighter station. Later Lodger rights for one squadron. RN Air Section withdrawn on 23rd December, 1943. The airfield is located 18 miles S. of the port of Oran, adjacent to the Se shore of the Great Sebkha Salt Lake . The Great Sebkha Salt Lake. The port of Oran. It is not known what arrangements were made for lving quarters . Detachment (?) from RN Air Sect North Front operated here 27.10.1943 to 21.05.1944 . Main base at RN Air Sect North Front. Operated Albacore I & Swordfish I. A French Naval aerodrome twelve Miles southeast of the city of Oran, Tafaraoui was captured by the allies on November 9th 1942 as an objective if ‘Operation TORCH’ - the allied invasion of North Africa, The airfield was to be the operational base for the Twelfth Air Force in North Africa. The Fleet Air Arm arrived on the station the day after it was opened for allied operations; a detachment of 6 Swordfish IIs of 813 Squadron arrived from RN Air Section North Front on the 10th, they stayed for only four days before returning to Gibraltar. 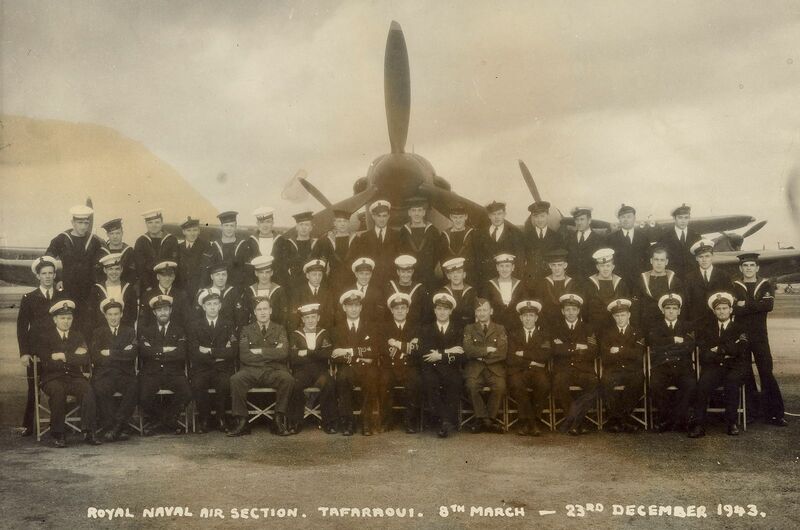 The Navy did not return to Tafaraoui until March 1943 when the Seafire Ibs of 885 naval air squadron disembarked from H.M.S. FORMIDABLE on the 15th before re-embarking eight days later on the 22nd. An R.N. Air Section was established on the station in March 1943 comprising of 3 Officers and 40 Chiefs, P.O.s and ratings under the command of Lieutenant Commander (P) J.R.S. Thompson R.N. On May 3rd 1943 the section commissioned as part of H.M.S. CORMORANT II, The section was a satellite to RN Air Section North Front, Gibraltar, H.M.S. 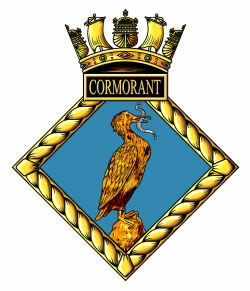 CORMORANT II and was responsible for providing shore based support for aircraft disembarked from carriers operating out of Oran and detachments from squadrons based at RN Air Section North Front. The first arrivals for the Air Section were a detachment of Martlet fighters from 888 naval air squadron based at North Front, Gibraltar on April 6th, 1943. The following day the Seafire Ib’s of 885 naval air squadron and Albacore Is of 820 naval air squadron flew ashore from H.M.S. FORMIDABLE, they both re-embarked on the 14th; the Martlets departed for Gibraltar the same day. 820 'Z' flight was put ashore from H.M.S. FORMIDABLE on April 18th and they remained here until May 26th when they re-joined the carrier. A second detachment from 888 arrived here on April 30th, together with the return of 885’s Seafires on May 1st. The Martlets departed for Gibraltar on May 3rd and the Seafires and 885 returned to their carrier on the 4th. A second detachment of 6 Swordfish IIs of 813 Squadron arrived on May 8th for operations with the Northwest African Coastal Air Force and they were to remain until after the launch of operation ‘HUSKEY’, the allied invasion of Sicily in early Ju,y. A lone Swordfish from 728 Fleet Requirements Unit at North Front arrived on the station on the 11th to provide a drogue towing service for vessels and anti-aircraft fences in the area. 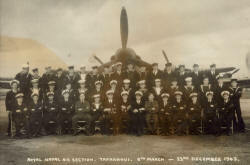 The Albacores& Swordfish of 826 squadron arrived on May 30th, having relocated from RAF Bone, they were joined by the Seafires of 885 which flew ashore from FORMIDABLE on June 2nd for one final visit to the station; they were joined by the Martlets of 888 squadron which moved here from RNAS North Front on the 3rd. Both 885 and 888 embarked in FORMIDABLE on the 14th. Also present during June was a detachment of Martlet fighters from 893 from North Front which operated here June 8th – 14th. 728 returned to North Front on June 15th after operating here for just over a month, the FRU task was next taken up by a detachment of 4 Boulton Paul Defiants of 727 Fleet Requirements Unit which flew in from North Front on June 25th; they were to be the resident RN unit for the remainder of the Fleet Air Arm presence on the station. 826 departed for RAF Takali, Malta the following day. On July 10th the 813 squadron detachment departed for RN Air Section North Front leaving only the Defiants of 727 FRU in the care of the Air Section. This situation remained until a detachment of Beaufighters from 779 FRU at North Front arrived on October 27th. The RN Air Section withdrawn on 23rd December, 1943 but lodger rights for a single squadron were retained. 779 squadron Beaufighters continued operations until May 21st 1944 when the squadron disbanded; the last naval aircraft, the defiant target tugs of 727 Fleet Requirements Unit were withdrawn when the unit disbanded on December 7th 1944. The personnel of R.N. Air Section Tafaraoui with the Defiant Target Tugs of 727 FRU. Photo: Courtesy of Peter Langsdale whose father RAF Flight Sergeant CFW Langsdale is pictured 6th from the right in the front row.